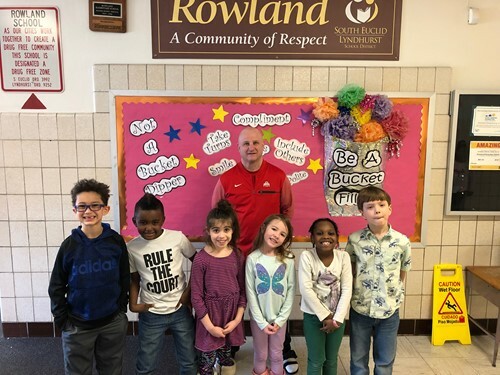 Rowland Elementary students recently participated in the Kids Heart Challenge, an annual initiative sponsored by the American Heart Association which seeks to increase awareness about heart-healthy living and raise funds for lifesaving scientific research. Physical Education teacher Gary Waite organized the fundraising efforts and incorporated the Kids Heart Challenge into physical education activities for each grade level classroom. Students learned how to become “Heart Heroes” through raising donations and completing daily challenges such as exercising for sixty minutes every day, eating heart-healthy foods, and choosing water over sugary drinks. To encourage physical activity, students learned and practiced jump roping skills through various activities during physical education class. Altogether, the entire Rowland Elementary School community raised approximately $836.68 in support of the American Heart Association and life-saving treatments for kids with special hearts. A big congratulations to Rowland Elementary School for supporting the Kids Heart Challenge and making a difference in the lives of others!